Nothing like the end of the year to look back and pick out favorites. And thanks to Sarah of Fantastical Sharing to prompt us to look back and pick out the best of the year. And the most popular recipe of 2018 was the Forloren Hare, but I've already told you about that one. So, pardon me, but I'll actually share the second most popular one which is this. Hindbaersnitter, or Raspberry bars. A favorite treat for youngsters in Denmark, they can stop in the bakery on the way home, get one of these really sweet and yummy bars and be set until dinner. Be warned, these are sweet, but oh so very good. I really don't use my crockpot enough but there was one standout dish I did make this year, and that was this one for our Soup Saturday Swappers. It was so good, I made it several more times just for me. I'm talking a tomato soup that will make that stuff in the can, cry. I can't believe how fresh it tasted. And here it is, a repeat performance on the blog, Tomato Soup in the crockpot. In fact, I may just have to make it again this week. 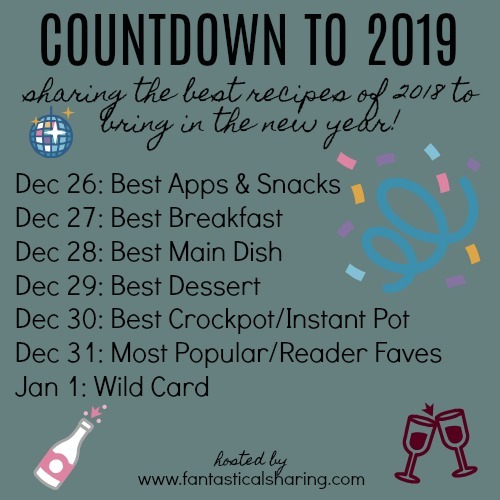 Well, thanks to Sarah of Fantasical Sharing, who came up with this idea of sharing some of our favorite recipes from the past year. Each day has a separate theme, and today it's Crockpot or Instant Pot recipes. And now it's time for the best dessert of 2018. 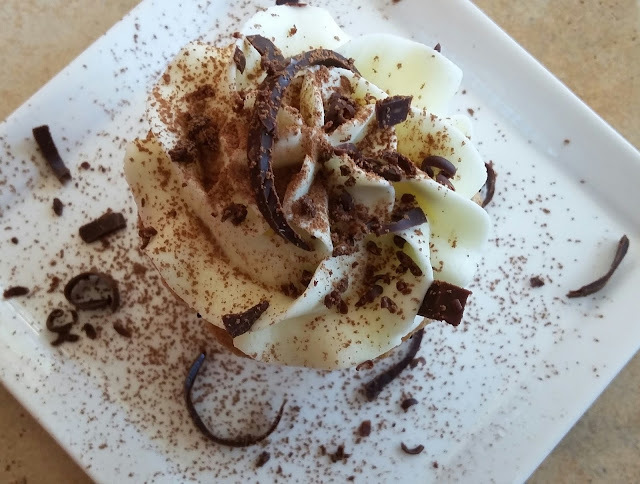 I made a Tiramisu for a friend's birthday and loved it. As did everyone else there, but I loved it so much I decided that I could try my hand at making them into cupcakes as well, so I did, several times. I'm planning on making a Tiramisu soon, or maybe just cupcakes. We now come to the Best Main Dish of 2018. I made a few great ones, but the one that I think is the best is this. At least it was my favorite. In fact I liked it so much, I made it a few times. It's called Forloren Hare or False Rabbit in Danish, and if you're a bacon lover, this meatloaf is just hands down the best. Served with a good brown sauce and boiled potatoes, heaven. And for day two of the round up, I'm going to say these Lavender and Lemon Scones were a perfect breakfast. And one of only two breakfast dishes I made this past year. Check out some of the other great breakfast's below. I can't believe it, and although I missed yesterday, I'm going to add it in anyways, cause I can. And the Best Appetizer I made all year long , well, all I can say is this, I've made it a few times. And every time I make it, it disappears. Best part is, it's easy to make and I usually have all the ingredients to hand. Although I am temporarily out of capers, but that's easy to remedy. The winner is: Savory Salmon Cheesecake. This great link up party and it is a party, this month, was started by Wendy of A Day in the Life on the Farm a couple of years ago. 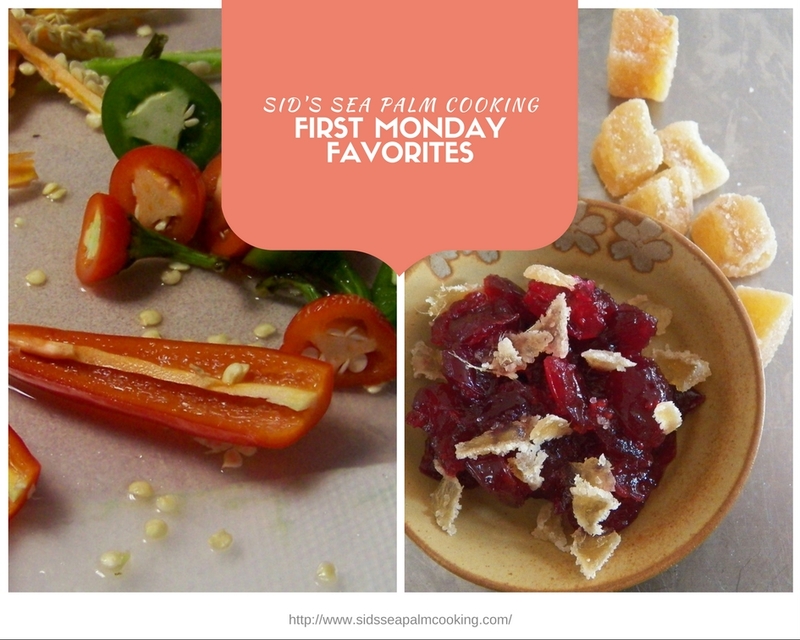 We get together the third Friday of the month, make and link up a seafood recipe that encompasses the theme of the month. 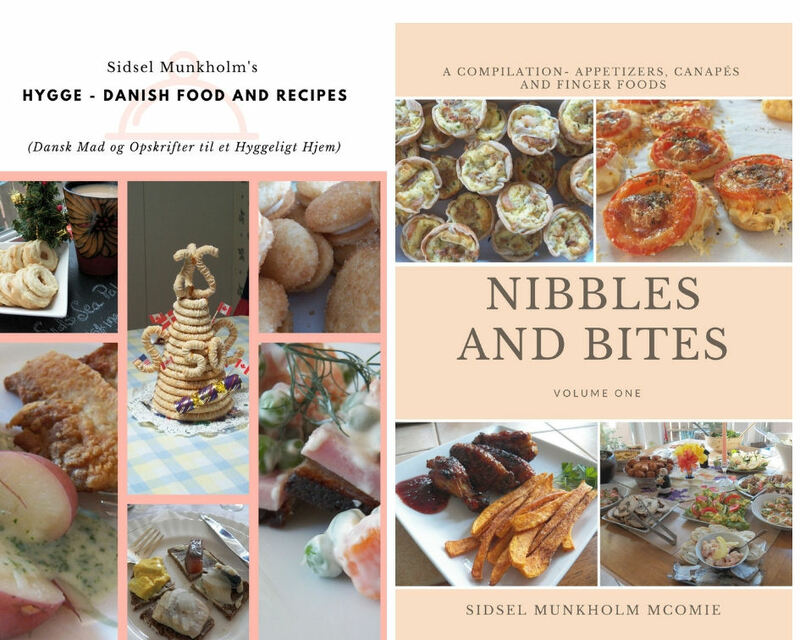 I've had such fun coming up with recipes, and eating them as well, for this event every month. In fact, I don't think I've missed more than a couple over the past couple of years. And I love doing it. Although I usually do shrimp recipes, mostly because shrimp are plentiful here and easy to purchase right off of the shrimp boats sometimes. And I like shrimp as well. So much so, I've got a shrimp cookbook coming out in the New Year, featuring some of my favorite recipes. I also thought I'd be doing another shrimp recipe this month as well, but something got into me at Trader Joe's last weekend. I found some frozen salmon, and decided to try my hand at making some Gravlax or Gravad Lax for a party this weekend. Now Gravad Lax or Gravlax, as I say it, is an interesting dish. As a Dane I'm used to eating raw fish which has been preserved using salt or vinegar or smoking. This salmon is cold cured or preserved using a mixture of salt, sugar and dill. I also used a fair amount of pepper and some aquavit I'd made a few years ago, which was a little too intense in dill flavor for me at the time, but when I tasted it again the other day, I discovered that it has matured beautifully. I think I may need to taste test it again, soon. I used some peppercorns along with some coarse Himalayan Salt and crushed it up and also uses some raw sugar. I love using my little mortar and pestle. Back to the history of Gravlax. Fishermen used to lightly salt their salmon and bury it, letting it ferment a little. They would then dig it back up, and serve it, but as you might imagine, just salting and fermenting it made for an interesting, not particularly appetizing dish. So, people started adding various spices to the fish, which made it more palatable. You can actually read more about it here. And I looked at a lot of recipes and they were all pretty much the same, although I shamelessly copied the mustard sauce from a friend's blog. I did put my own spin on it, mainly because I thought that the Pomegranate and Quince Balsamic Vinegar I had in the cupboard would accent the other ingredients. and it did. I also added some Creme Fraiche cause I like it. Tove has some incredible recipes as well. 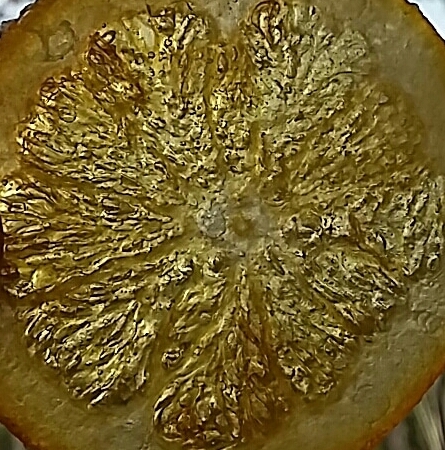 Check out her blog, Sweet Sour Savory. Without further ado and before it gets any later, here's a few pictures. Some recipes suggested chopping up the dill but all I did was crush it a little. Slicing it as thin as you can. I'm letting the rest of it sit in the fridge so I only cut enough for breakfast. Hey, you can eat fish for breakfast, why not? Some of the mustard sauce draped over the salmon and the rye crisp cracker. I had to put it down and take another picture. If it hadn't been so early, I would have had a glass of Aquavit with it. Maybe for lunch? This lightly cured salmon tastes so good served with a mustard sauce on top of a piece of crispbread. Accompanied by a glass of aquavit, of course. 2 tablespoons Dijon Mustard ( I love the stone ground Dijon so that's what I use). Rinse the salmon and then place in a glass dish, skin side down, sprinkle the salt, sugar and pepper on top. If using two fillets, sprinkle the flesh of the salmon with the spice mixture. Add the dill and sandwich the two pieces together, with the skin side out. Cover with plastic wrap and place into the fridge for several hours. Turn over, and re-cover the fish. I was running out of fridge space so I very carefully placed the fish fillets into a plastic bag, and pressed out as much air as I could. I then put the fish back into the fridge, turning it over every few hours to enable the liquid to coat and cure the fish. Leave in fridge for at least 48 hours up to 72 hours. When ready to serve, take out of fridge, give it a quick rinse and wipe dry. Discard the pickling liquid, and slice the salmon thinly at a 45 degree angle. You can cut it away from the skin or take the skin off. Serve with a mustard sauce and some ryebread or rye crispbread. Whisk all ingredients together and then taste, add salt and pepper and the dill. Serve alongside the Gravlax and some nice bread or ryecrisp crackers. I wasn't sure I'd be participating this month, but dinner the other night had a scant cup of leftover casserole filling along with some leftover canned corn and then I remembered I had some leftover sausages and meatloaf in the freezer. I also had some leftover green onions and half a tomato. Why am I telling you all about my leftovers? Well, the theme this month is soup made from Leftovers. It's hosted by Karen of Karen's Kitchen Stories. She asked that we make a soup from leftovers, whether from the holiday or whatever leftovers we had. Usually I have all kinds of bits and bobs of leftovers in my freezer, but I've been making a very conscious decision to cook only what we eat for a meal. That's just cause the freezer was getting pretty full there. And when 'someone' doesn't label items properly, you can get some interesting items left over. OK, so it's me. I tend to wrap up something, think I'll remember what it was in its' previous incarnation, but I don't always succeed. And I'm tired of playing mystery ingredients. New rule, I label and date it all and if it's not used up within a month, it becomes an offering to the Kitchen Goddess or her consort the Garbage Guy. Well, as I said, I wasn't too sure I'd be joining in the soup-fest this time round, but I did. And I even used some leftover bread from the freezer as an accompaniment to the soup. Score! This is not a proper recipe per se. It did incorporate leftovers from three separate meals though. And it made enough for two filling meals, OK, two lunches and one breakfast. I like having a hot bowl of soup for breakfast. And since it had sausage in it, I figured it was breakfasty, well that and the slice of cooked, chopped bacon I topped it with. Mix all together and simmer for 10- 15 minutes, top with the cooked bacon and serve. This goes really well with some leftover No-Knead bread. I think you could use any kind of leftover casserole filling and just add a few extra ingredients to make a tasty, filling and totally delicious soup. I was all set to make a Gingerbread House - I might still make one - but fortuitously, it's also the week I bake and donate a cake to our local Legion for their cake-raffle. They raffle off a cake every week, and use the funds for local projects. I figure it's a win win situation, I get to bake, and don't have to eat it, (saves a little when I step on the scale), and they get a cake they can raffle off. They do appreciate it as well. If I'd had my wits about me, I would have just told you about the last cake I made, it had Ginger in it, as well as on top, but it wasn't a true Gingerbread cake. It was darn good though. Anyhooo, I went through my cookbooks, found this recipe in a cookbook that I received at my bridal shower, a few decades ago, and decided to make it. Then as I looked at the ingredients, decided to play around a little. It's my cake and I can play if I want to. I done made a full on touchdown, again. See, I do know some football lingo. One of the fun things I did, to up the "gingerbreadness" of the cake was make up a gingerbread spice mix. I went to my Brunekager recipe, for the spices, and then played with the proportions a little. And I added some crushed allspice along with touch of nutmeg. For the frosting, I went with my favorite frosting. It's basically a boiled milk frosting, aka - Ermine frosting or Faux Buttercream along with a few other names. I amped up the flavors a little though. I wanted the frosting to have a distinct ginger taste so I heated up the milk with some of my homemade candied ginger, let it cool and fished out the ginger, and kept it. After I tasted it, I decided it was almost perfect. I wanted an over all ginger undercurrent and I got it, sort of. It wasn't quite gingery enough though, so I added a half teaspoon of powdered ginger and that made it perfect. Next time, I'll just add the powdered ginger and forget about simmering the ginger in the milk. I also went to Cook's test kitchen to see if they had any hints, and found a recipe that sounded amazing, but was just too darn fiddly. Although I appreciate the time and effort they put in to develop the recipes. A couple of hints for decorating. 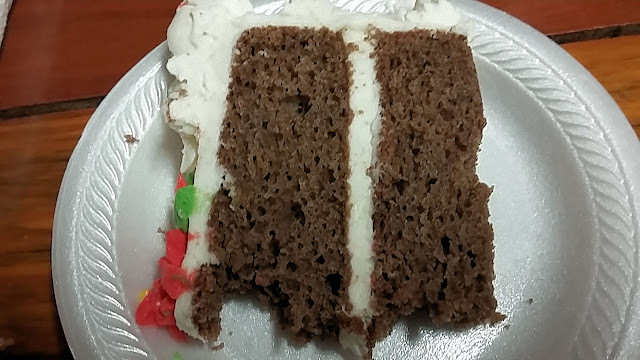 Place a dab of frosting on the middle of the cake plate and place the first cake layer on top of it, bottoms up. Then place half of the frosting in a piping bag and pipe a ring around the outside of the first layer and then fill in the middle. So much easier to get a nice even layer down, and the ring around the outside helps to fill in the gap between the first and second layer. And then I had fun. I colored a little of the frosting red, and a little green and piped poinsettia flowers on the top. I didn't get too carried away, did I? I finished it off with some star tips around the edge and some on the sides as well. I did get some major thumbs up on the cake I made though. It was rich and gingerbready without being overly sweet or cloyingly spicy. I did get to taste the cake, as the winner shared the cake out with everyone. The frosting had a lovely creamy ginger spice to it and that just added to the cake. The cocoa added a rich dark look and the coffee extract added a nice note as well. This dark, rich Gingerbread cake is perfect as a layer cake, slathered or frosted with Ermine Frosting. The hint of ginger in the frosting, complements the cake beautifully. Whisk the flour into the cold milk and cook over medium heat, stirring constantly until the mixture comes to a boil and thickens. Set aside to cool, then press through a sieve to remove any lumps. When totally cold, cream the butter and sugar in a stand mixture until the sugar has broken down. Add the cooled cooked milk mixture, 1/4 cup at a time and whisk at a high speed. This mixture will look kinda weird at first, but letting it mix for about 7-10 minutes will make it double in size almost. This recipe makes enough to frost a two layer cake. The taste is lighter and less sweet than regular buttercream. Sift all the dry ingredients together and set aside. This is especially important if you ground your own allspice and also helps to break up the cocoa powder. Preheat oven to 350 degrees and grease and flour 2 - 8 or 9 inch cake pans. Pour half the batter into each pan and bake for 25-30 minutes or until the cake springs back with a light touch in the center or a toothpick inserted comes out clean. Invert onto a cooling rack. If you wish, you can take a little of the frosting and tint some red and some green and pipe poinsettia flowers on top to decorate the cake and make it look festive. Note: I actually weigh each layer on my scale. This helps me to keep it even.